Over 40 skins including CPU, Hard Drive for up to 4 drives, Network, Slideshow, several RSS Readers, Notes, Weather, and many more for both the Sidebar and the Taskbar. Unzip Seclorum.zip and double-click Seclorum.rmskin to install. 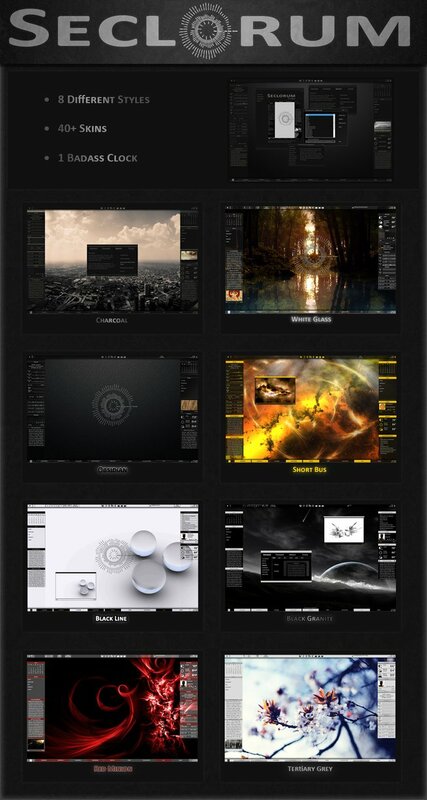 Seclorum requires the latest version of Rainmeter 1.2. Open up the Configuration tool on the launcher by clicking Configure and input your variables. Read the Readme for further information. To change the visual style click Styles on the launcher. To open a skin, go to the Sidebar or Taskbar tab and click Open on the skin that you want to load. Still one of my faves! Got all three and I must say ... you rock! JC, are you using the Configure tool to enter your code CAXX0126? I tried it, and that code worked for me? Yes I used the config tool. I entered CAXX0126 and set the temperature unit to c. Do I have to enter the weather low high variables to make it work? Right now all I get is NA even after I refresh. OK I got it to work. Not sure what the problem was but I deleted the skin folder and re downloaded and now it works fine. Congratulations on the feature Varelse42.